In the six years since Nissan dropped the Skyline moniker and detonated our dynamic expectations, it has responded to this vocal minority with incremental improvements. 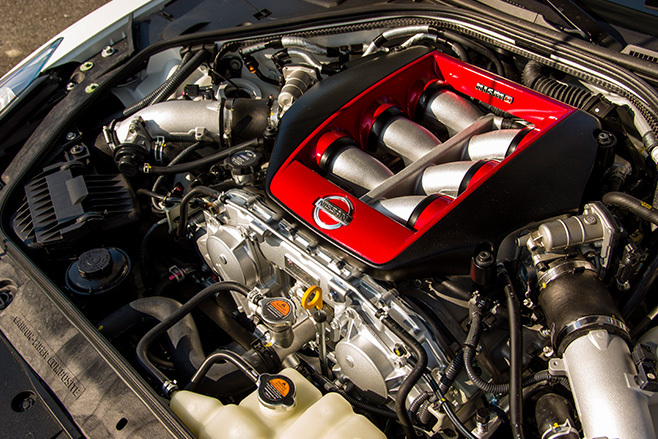 Its emphatic answer for the 2014 model year is the 441kW Nismo. The Nismo is destined to become the flagship of Nissan’s much-expanded tuner division when it goes on sale next year and, although numbers won’t be limited, Nissan reckons no more than 200 will be produced annually. Even with a mighty premium over the stock GT-R, demand is likely to outstrip supply but Nissan has already softened enthusiasts up with news of a stunning Nürburgring lap time of 7min 8sec. You could never mistake the stock MY14-spec car with the Nismo. Aerodynamic improvements lower the centre of gravity at speed and the carbonfibre add-ons are influenced by the Japanese Super GT race car. The Nismo gets a new, wider front bar, elongated rear bar and an even lairier rear wing, resulting in an extra 100kg of downforce at track velocities without affecting drag. Custom suspension, featuring Bilstein DampTronic dampers and new upper links on the front wishbones for increased caster trail, is tuned to work with the extra airflow and there is now a 17.3mm, hollow rear anti-roll bar. The emphasis is on improved rigidity, stability and greater grip, helped by bespoke Dunlops and slightly wider 20-inch alloys up front. The 3.8-litre V6 has larger, high-flow turbochargers (previously reserved for the GT3 racer), improved ignition timing, Nismo-programmed ECU and a higher-capacity fuel pump, raising peak power by 37kW. a few tenths quicker than the ‘regular’ car. 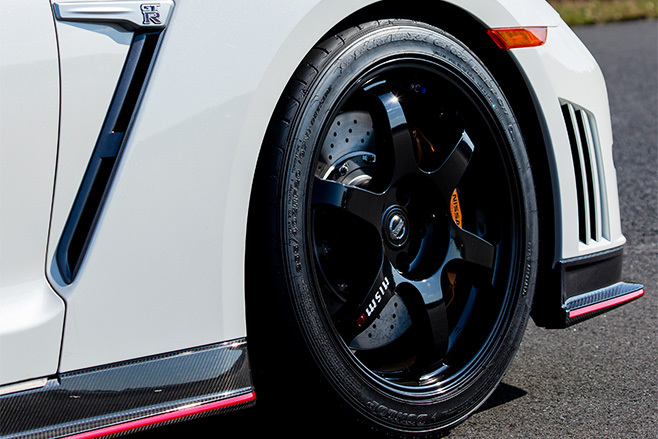 Barely 20kg lighter than standard, the Nismo’s superior stiffness and body control makes it a bit pointier and continued resistance to understeer, along with a liberal attitude to rear-wheel slip in Race mode, means the back end slides progressively. 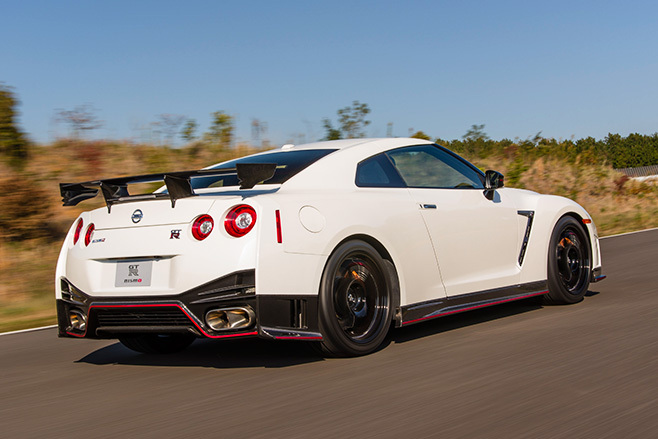 The Nismo is a GT-R with more but isn’t the same car that confounded the stopwatch at the ’Ring. That requires the optional Track Pack (an additional $10-15,000) which adds a bigger rear wing, adjustable dampers and better brake pads – and it’s 50kg lighter. It is the ultimate GT-R. But a fantasy time at the ’Ring is a distant second to feel and responsiveness, and the Nismo cranks up the GT-R’s capabilities without winding down your ability to control it. Fan boys, go crazy.